This post is basically about how SAS reads the record and internally processes it. To start with lets check some basic sas concepts which comes into play when ever you run a simple SAS program. It usually begins with a SAS keyword. It always ends with a semicolon. Here, i have highlighted the SAS keywords in blue. CUST will be the name of the sas Dataset which SAS will prepare internally once this step is executed. INFILE CUSTPOL : Here the CUSTPOL is the name of the physical(external) file from which the data is to be read. INPUT will take only those fields from the specific positions and only those fields will be present in the SAS dataset CUST. The above SAS DATA step is processed in 2 phases. A) Compilation phase: Each of the statements are checked for syntax errors. Once it completes,execution begins. B) Execution phase: Data is read and executed unless otherwise coded. During Compilation phase, an input buffer(memory area) is created to hold the records from file. It is created when the raw data is read. It is just a logical concept. When the data is read, SAS builds a data set in the memory(which is very much internal to SAS) known as SAS data set. This Program Vector contains automatic variables that can be used to track the number of observations,and comes handy in many ways. 1. _N_ counts the number of times that the DATA step begins to execute. 2 . _ERROR_ signals the occurrence of an error that is caused by the data during execution. The default value is 0, which means there is no error. When one or more errors occur, the value is set to 1. At the beginning of the execution phase, the value of _N_ is 1. Because there are no data errors, the value of _ERROR_ is 0. When we define the DATA step, we should try to use the minimum variables. Unnecessary declaration of the variables makes the SAS internal dataset bigger which can lead to more execution time. During execution, each record in the input raw data file is read, stored in the program data vector, and then written to the new data set as an observation. At the end of the DATA step, several actions occur. First, the values in the program data vector are written to the output data set as the first observation. Each time SAS executes its step, it writes log . In z/os environment, it will be written to SASLOG.Looks like below. It shows the number of records read, the number of records which gets selected in the criteria and finally goes into sas dataset. NOTE: 17430 records were read from the infile CUSTPOL. The minimum record length was 600. The maximum record length was 636. NOTE: The data set WORK.CUSTPOL has 5818 observations and 12 variables. ESDS can be accessed sequentially or directly. They can not be accessed skip sequentially. ESDS are mostly where we write logs and it can be accessed sequentially. ESDS record can be located sequentially by checking each record, starting from the beginning of the data set.Also an ESDS record can be located directly if the relative byte address(RBA) of the record in known.This location can be derived from some previous search or by remembering the address where the record was inserted. New records must be inserted at the end of the file. 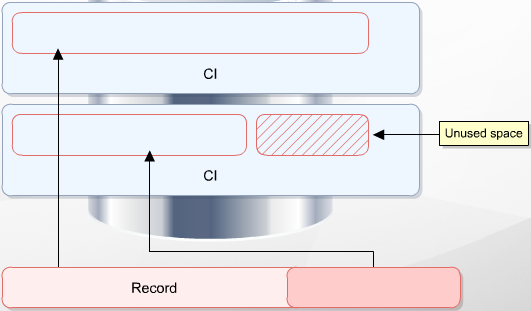 Each record is inserted at the end of the latest CI.IF there is no enough space in the CI, then a new CI is started. Deletion of records physically is not possible.If we do not need one record, we can mark it as deleted , but it will remain in the dataset until the ESDS is re built again. Updation of the records can be done where they are provided the length remains the same.If the length changes, the record must be marked as deleted and added as a new record at the end. RRDS is another type of VSAM.It consists of fixed length areas called slots. These are pre-formatted when the data is created, or whenever a new CA is created.Records are inserted into the slots. In RRDS, Records can be added and deleted within these slots. The Application program can insert into any free slot which is know as Direct insertion. The application program can request the record to be inserted into next free slot which is known as sequential insertion. While deletion, a record can be deleted and slot can be re used. In RRDS, all the records must be of same length. Unlike ESDS, we can not have Spanned record in RRDS & We Can not have Free space in RRDS. Linear Data sets holds the records in the form of strings of data. There are no CIDF or RDF. Most common usage of LDS in DB2, which uses LDS to store objects. Internally Z/OS uses DATA IN VIRTUAL(DIV) services or WINDOWS SERVICS to insert/update/ delete the data. We need to have the data to be sorted when its inserted into a KSDS. The Key part can be 1-255 contiguous bytes and must be unique. Each Key points to the data part. As we Insert,update or delete a record, this Index component gets automatically. The Rounded Yellow part signifies the Vsam Name and is know as the VSAM Cluster. It relates the Data and the Index part. It is not a file, just a catalog entry. Records in a KSDS can be updated and their length can be changed.If he record is reduced in length, then the remaining space can be used as free space, else if the record length increases, the record is moved to Free space to make room for the new updated record. This post is just a short writeup for VSAMs. What is a Vsam file? Virtual Storage Access Method : This is one type of dataset and APIs to access the dataset.It is an excellent database to keep the records as they can be read sequentially,directly or skip sequentially. We must know that VSAM dataset must always be kept on disk and not on Tape. IBM newly introduced an extension of the VSAM known as Extended Format Vsam . To an application , a Vsam and extended Vsam are all same.Extended vsam provides some addition features like compression of the data, sharing, improved performance and allows a maximum data set size if 128 terabytes. Control Interval which consists of bunch of records. What are CIDF , RDF in VSAM ? Apart from keeping records in a CI, Vsam places two additional fields which are needed to manage CI. They are CIDF and RDF. The Dotted space shows the unused space in a CI. 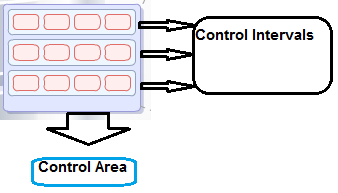 What is Control Area ? Group of CIs make one Control Area (CA). Group of Control Interval is called as Control Area. While inserting a record, if the Record size is larger than the CI size, it can not be stored. In such scenarios, CI splits happen if the vsam is defined with SPANNED option. The records then span across more than one CI and is known as spanned record. Spanned record occupy the entire CI. Any unused space in the CI can not be used. Most of us have definitely seen or used in some way or other the command shell(option 6) from ISPF panel. This is very useful command window. TSO /E allows us to talk to MVS either through TSO E commands , or the ISPF pannel(like option 6) as i was mentioning above. In some work , i came across a scenario where i need to execute certain commands in command shell. The simplest way is to to go to ISPF and go to option 6. Then execute each command manually . But the tweek in my case was to execute these commands in batch and collect the command logs, ie, whether these commands were executed or not and all details. So, here is the utility IKJEFT01 which we can use. Its other name is terminal utility program. Whatever we want to execute in the pannel screen can be executed from batch as well using ikjeft01. So, lets have the JCL for using this utility. 4 . Check job status and many other useful functions. SMCOPY is the command to copy. FDS and TDS means From dataset and To dataset respectively. Will explore some more and update as time permits!. A data file is nothing but a collection of relevant records. Cobol reads the records line by line. Read the first line and process the entire logic,then read the second record and so on... Generally we use two types of file in our program. What is a sequential File ? A sequential file is one whose records are in sequential order, from first to last. When we want to process this file, we need to start from the first records and go on sequentially. We can not delete and insert record in the middle suddenly. We can only add the records in the end. Coming on to Vsam file, we have mainly 3 types which we use frequently in program. a) KSDS b) ESDS c) RRDS. We will see what they are and how to handle them in subsequent posts. Before going into details, we need to know the bare essentials needed for file handling. 5. Write the output and Close the file. The Very First step in writing a Cobol is to assign the Files . We all know that to run the cobol program ,we need JCL. So, JCL is the place where we give the actual physical file needed to run our program. But, Our cobol program need to understand this thing. So this association between the JCL file and the cobol program is established in Environment Division using 'ASSIGN TO' Clause .The mapping with JCL DDNAME is done here. The file is allocated to our program by this ASSIGN Statement. Next, the layout of the file and its attributes are defined in the FILE SECTION of DATA DIVISION. We should have a copybook to identify what value corresponds to what fields. That needs to be predefined in a copybook and should be included in the program using COPY statement. But, before cobol uses these files for reading or writing, we need to OPEN these files with some keywords which will make cobol understand, whether the file is a input file or it will be used as an output file. We need to use these statements in the procedure division to instruct cobol the kind of operation we will be performing on the files. Have a look into the JCL for better understanding of the file association between cobol and JCL. Look for the DD names CMFIN,FILE1, FILE2. 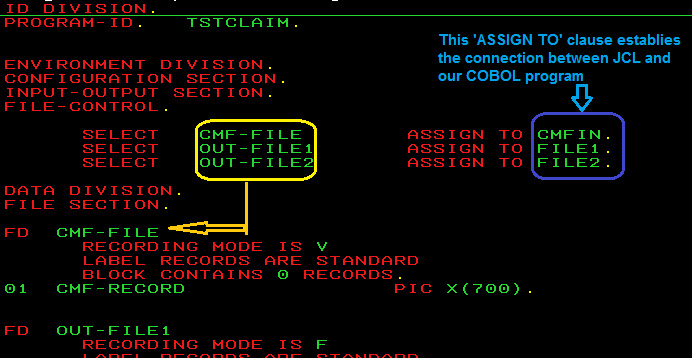 Back to cobol: Once the above declaration is made, we can use the input file to read the input records one by one and process it. So, what is this W-CMF-CLAIMS-DETAIL ? This is the copybook which is defined for the input file. This READ statement dumps the every line of the input file into this structure , so that we can use these variables and process the data. Every time the read statement is performed, these values will get changed for the next record and so on until EOF (End OF file) is reached. Do All the processing as per the requirement in the procedure division and then the very last steps in this process would be writing the output file and closing all the files. Can we create a VSAM file with IEFBR14 ? The Answer is 'Yes', we can, but with some limitations. We all know or used to IDCAMS when it comes to VSAM creation. But even IEFBR14 can create VSAM with some advantages and disadvantages! RECORG Is the important parameter to note. Its value determines the type of VSAM dataset the job will create. 'KEYOFF=' will define the key offset length. Here the value of '0' indicates the first byte. 'SPACE=' will allocate the space .Here it is in cylinders, the primary and secondary being 5 each. We can use the AVGREC parameter along with the SPACE parameter like below.The value of AVGREC has some significance. So here, the primary space large enough for 300*60=18000 bytes and secondary for 1200 bytes. Q 1: Syntax Checking of the SQL statements are done in Precompilation time or Bind time? Both. Let me explain it in details a bit. We all are aware of DCLGENS and we use INCLUDE statements in our cobol module to include the DCLGENS. Precompilation process only uses DCLGEN as the reference for table description (provided we use DCLGEN).It does not go and check the DB2 catalog for the table structure. If no DCLGEN is used, no synatx checking is done in precompilation time. Q2: Can 1 package have more than 1 DBRM ? From 1 program, we get one DBRM and then we bind the DBRM into a package; in the sense, 1 package is the DB2-optimized version of the that single DBRM. Each Package is nothing but a single bound DBRM. There is direct one to one relationship with application program and package. No. In DB2, only plan is the executable module. Will keep on adding as and when i come across!!.. suggestions most welcome! When we create a VSAM,all its details are recorded in the catalog table in MVS. LISTCAT is a versatile command meaning 'List Catalog'. LISTCAT command can be fired from command shell (option 6 from ISPF menu ) or it can run in batch as a SYSIN parameter to the IDCAMS. We will get the information's being displayed on the screen page by page as we hit enter. It implies that this VSAM is not password protected. Also the ASSOCIATIONS parameter will list down all the datasets with the same name pattern and we can see that it shows the data component and INDEX component. So our VSAM is probably a KSDS. Look in the ATTRIBUTES Section. ATTRIBUTES section will give a more clear picture on the VSAM definition, ie how it is defined . So, from these statistics we can somewhat guess the definition.Like, for the above VSAM, the key is of length 16 and offset of the key position being 20. The AVGLRECL and MAXLRECL will give us the idea about the record size parameter used in definition which in this case is 191 and 1500 respectively. SPEED and NOERASE are also keywords in VSAM world. If we look a little right on the mainframe screen we will get the information about the CI size . So, the CISZ parameter will be of length 18432. CISZ(18432). The CI/CA in VSAM indicates the number of CI in each CA .Thus the above information tell us that there are 45 CIs in each CA. This Section really gives us all the details regarding the statistics of the vsam in that moment. Will see more in details later. As of now check out the FREESPACE parameter % CI and % CA. Those are the parameters with which the vsam has been defined. Ohh..!! one more i got in the Allocation section. This is more or less self explanatory, ie, the allocation quantity is CYLLNDER and primary and secondary allocations are 60 and 10 respectively. So few more added in our cart. 2. REC-TOTAL :Total number of logical records in the data component in that instance listcat was run. 3. REC-INSERTED: Total number of logical records inserted in data component ,since the vsam was last created or re-organized. 4. REC-RETRIEVED : total logical records read from data part since its creation or reorganized.It takes into account reads for update during REWRITE processing. 5. REC-UPDATED : Total number of logical records UPDATED or REWRITTEN back into the data component since its last creation or last it was reorganized. Does not include DELETED records.However if a records is updated, and may be got deleted later ,is counted here. 6. SPLITS-CA /SPLITS-CI : Total number of CI and CA splits that happened since it was last created or reorganized. In the performance tuning posts (db2 performance issues and tuning part 1, part 2) , we have discussed how indexing can help tuning database performance to a great level but, today we are going to discuss about the proper design of indexes. As indexes provide easy access to the data rows in a table just like a book’s index, it speeds up the query execution process and thus helps to tune the database performance. But, what it does actually and how it does? An example will help us to understand it in a better way. 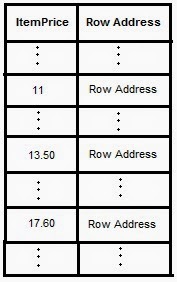 Say we have a tblOrder table with 100 rows and three simple columns: OrderId, ItemName and ItemPrice. Currently, we assume that this table does not have any index. So, to execute the above query, the processor starts searching each and every row one by one to get the required data. The below diagram depicts the actual processing done to do so. It definitely becomes an overhead to search all the 100 rows only to get a few set of records. Now, let us add an index on the ItemPrice data column of this table. It acts just like the index in a book. Adding an index to this column means, it stores the copy of the column’s data and a reference to the row where the actual data is stored. 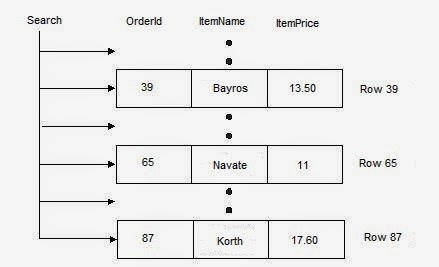 These index entries are also sorted in ascending order by SQL. Now, when we execute the above query again with an index added to the table, it will first find the value in the index and then it will take the reference stored in that index to point the actual data row. Thus index makes the query processing fast and wipes out the overhead of scanning each and every row in a table. 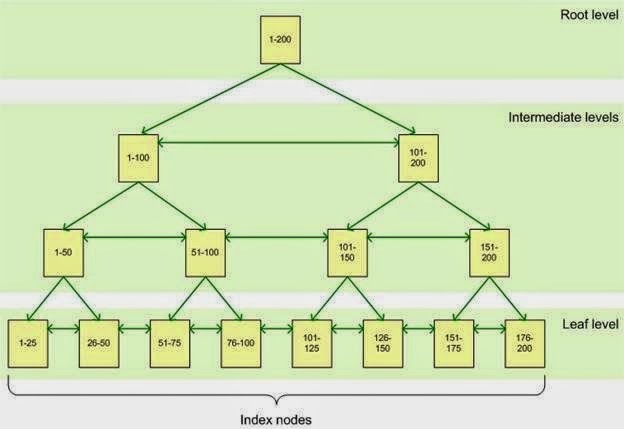 An index is a set of pages or index nodes which are organized in a structure called B-tree structure. It is a hierarchical structure with the root node placed at the top and the leaf nodes at the bottom of the hierarchy as demonstrated in the below figure. When a query is fired against an indexed column, the query processor starts scanning from the top which is the root node. Slowly it navigates down the intermediate levels or the next levels. The more we go down through the intermediate level, the more granular division comes into picture. The processor continues scanning the index nodes until the leaf node is arrived. Let us take an example of searching the value of 87 in an indexed column. As it is said earlier, the processor starts scanning from the root node and then gradually it goes down through the intermediate levels till the leaf nodes are reached. Here, we are trying to find the value of 87 which leads to the 1st page of the 1st intermediate level, i.e. the page with 1-100 values. Now it further goes down to get the exact value and it understands that the value can be there in the 2nd page of the 2nd intermediate level which is 51-100. As 51-100 is also not the leaf node, it searches down further and finally reaches to the leaf node and points to the page 76-100 which is the 4th page of the leaf node level. The leaf node may contain the full data row or the reference to that row. It solely depends on the type of index that we declare such as, clustered index or non-clustered index.